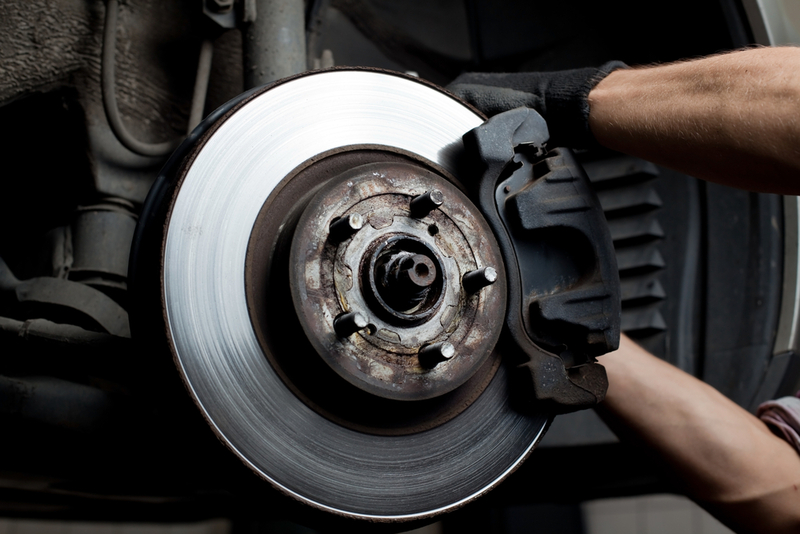 Home > Car Talk > Our Humble Auto Repair Shop Knows When You Need A Brake Job. Your vehicle carries some pretty valuable cargo and us here at Whittyz Auto Repair have definitely seen our fair share of problems. Let’s talk about a major safety aspect of your car, the braking system. The braking system on most people’s cars goes unnoticed since it is “out of sight, out of mind.” That is, until a problem crops up, which is usually in the form of the proverbial grinding when you push the brake pedal. What are the most common signs of brake failure? -Let’s take a look at these warning signs in more detail. 1. Crystallized brake pads and/or shoes: The brakes have become hardened from heat and are no longer effective at grabbing and stopping the rotation of the brake drum or rotor. This condition usually occurs after the brakes have been overused, either because of excessive panic stops or “riding of the brake.” The braking material must be soft enough to wear and grab hold of the drum or rotor to stop the car. Excessive overheating hardens the braking material and consequently, the brakes become ineffective. If you’re experiencing this you need to contact our Humble auto repair shop immediately. 2. Oil or grease soaked brakes can affect braking. Oil from the rear differential or front transaxle can get on the brakes from an oil seal that might have failed. Grease from a failed rubber boot on a front end component (such as a ball joint or tie rod) can find its way onto the brakes and cause this symptom as well. 3. Loss of power assist from the power brake booster is another cause of poor braking performance. It can occur due to a loss of engine vacuum, or deterioration of the vacuum brake booster diaphragm. 4. “Hot Spots” on the brake drums or rotors are hardened spots in the metal makeup of the drum or rotor that form from excessive overheating of the brakes. They resist the natural wear of the friction material (brake pads and shoes) that must take place during the braking process, consequently loss of braking power takes place. The pads and shoes have nothing to grip. Squealing or grinding noises coming from the brakes: This is usually an indication of worn or glazed brake pads. The squealing noise comes from wear indicators, which come in contact with the brake rotor when the brake pads are worn to the point of needing replacement. This design “tells” you that it’s time to check the brakes. Unfortunately, most people wait until they hear the grinding, which means that the brakes have ground through the wear indicators and into the rotors. If you hear squealing, get your brakes checked! Our Humble auto repair shop can schedule very quickly and you can set an appointment by clicking here. Waiting for the grinding noise will cost you money! There are no wear indicators on the rear brakes. Have them checked every six months or when you have the tires rotated. NOT when you hear the grinding! Procrastination has financial consequences. Pulling or Grabbing to One Side: This can happen for a number of reasons. Pulling can occur from maladjustment of the brakes, a frozen brake, brake fluid leakage, frozen emergency brake cables, or oil/grease leakage on the brake shoes or pads. Loss of Brake Pedal: This condition is usually a result of brake fluid leakage due to failure of a brake hose or a rusted metal brake line, a worn wheel cylinder or brake caliper, or a worn master cylinder. A simple “once over” of the system will reveal what’s going on. Pulsation of the Brake Pedal: The cause of this condition is simply heat and wear. Heat and mechanical wear thin out the brake rotor or drum which causes warping. This warping translates into a pulsation (up and down motion) of the brake pedal while applying the brakes. In this case, re-machining or replacement is the answer. Make sure you have the brakes checked for wear if they are pulsating, because they are usually worn beyond their serviceable life when they get to this point and replacement would be in order. Clicking Noises During Braking: This has been a problem ever since disc brakes came on the scene. The disc brake pads are held in place by pressure from the caliper against the brake rotor. It’s somewhat of a loose fit. The factory installs “anti-rattle” devices to stop movement of the brake pads, which will stop the clicking noise. These devices are made of spring steel. Over time they become brittle and break, allowing the brake pad to ride loosely in its seat, causing rattling and/or clicking during braking. Lit ABS Light: A plethora of cars with antilock brakes experience a lit ABS light. In this case, have the wiring harnesses and electrical plugs leading to the wheel speed sensors checked for wear and corrosion. These electrical components are subjected to environmental conditions. Consequently, they suffer wear from exposure and might need replacement or repair. There you have it! Check your brakes every six months to avoid unpleasant surprises or come by our Humble auto repair shop for help. High dollar brake work can be “head off at the pass” simply by keeping a watchful eye on your brakes.